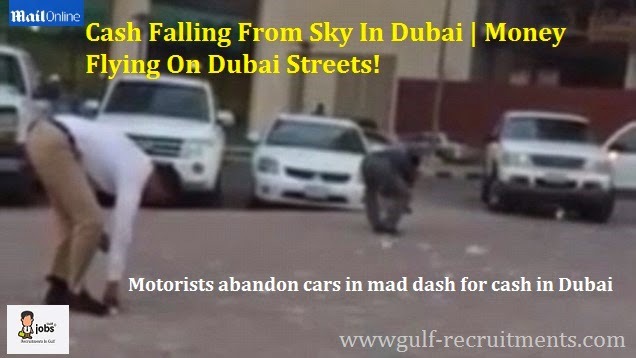 This is the incredible moment people in Dubai abandoned their cars and scrambled for cash after it started raining MONEY. Hundreds of thousands of pounds worth of cash fell from the sky and blew through Dubai, UAE, one of the most cash-rich cities in the world. Pedestrians proved that despite the country's riches, they weren’t above dodging traffic to pick up the swirling 500 UAE Dirham notes - worth around £88 each. The notes were carried by strong winds through the Jumeirah area of the city. One surprised local described how his wife pulled over her car to film motorists avoid people grabbing cash on a busy stretch of highway in the city. He said: ‘It was just raining money. It was 500 AED notes which is worth quite a lot. Police arrived at the area later and ushered people away. Locals still have no explanation for the incident which happened on February 11.